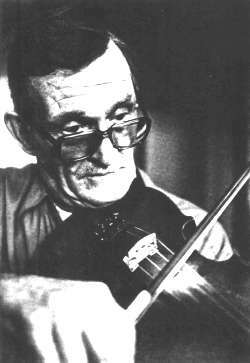 'The hottest damn fiddler in the history of West Virginia', young John Johnson was at the peak of his powers in 1947 when the folklore professor, Louis Chappell, caught up with him, having dragged his cumbersome aluminum-disc recording machine to Strange Creek, Braxton County, WV, in search of the elusive fiddler. John Johnson was an inveterate rambler who had learned, from his own family's hard experience in the 1930s, of the transitory nature of all worldly things. He was rarely in one place for more than a few months and reckoned he had worked in every State in the US, a good part of Canada and Mexico - and been in the jails of most of them. He was one of those natural musicians who was able to learn and play the most complex tunes from just one hearing but, as a consequence, set very little store by the music - indeed, he rarely owned a fiddle despite knowing that he could earn good money with one. On numerous occasions he just walked away from a gig, a job, a car, a wife, a life ... for no apparent reason, other than a vague wish to be some place else. When Chappell finally met him, Johnson was too busy to play for the outsider, but an offer of $200 changed his mind and he'd soon borrowed a fiddle. In one sitting, Johnny reeled off seventy or so dazzling tunes in a row, and a handful of songs. Nothing like that session has ever been captured on a recording, and this CD makes part of this treasure available for the first time. WVUP kindly provided me with a pre-production version of the CD, from which the few sound clips on the Advert are taken, above. The finished CD is now available from us - exclusively for the UK. A fascinating Michael Kline interview with Johnny Johnson appeared in the Winter 1981 edition of Goldenseal magazine, and I'm hoping to get permission to reproduce it in MT in the near future.